I mentioned that the seafood risotto I had at McCormick and Schmick's was my first taste of risotto. Well it was on the salty side, but I thought the texture was quite nice and I loved the creaminess. So I looked up how to make risotto, because I was always under the impression that it was hard to make, but it's actually not bad at all – it just requires a bit of your full attention for half an hour or so. That's encouraging! So tonight when I came home from work and needed a good idea for dinner, I decided it was finally time to pull up my sleeves and give risotto my best shot. I had those crab cakes in the freezer from my Christmas present food basket, so that seemed to be the perfect pairing with a nice risotto. Okay, so I did quite a bit of improvising making this risotto, because I didn't copy down a recipe (I just read the page I linked to above). So I'll just walk you through what I did and you can feel free to adjust as necessary. I first brought a few cups of water to a simmer on the stove (my condensed chicken broth paste requires hot water to dissolve – if you are using canned or homemade broth, just heat it up to almost boiling and keep it hot). Next I diced up half of my onion and threw it into a skillet with olive oil on medium-high. I sauteed the onions until they turned soft and brown… I actually thought I had burned them! I decided to set the browned onions aside and start over. I diced the second half of the onion, into finer pieces this time, and cooked them again on medium high except I took them out of the pan when they were still yellow and beginning to turn translucent but were not browned at all. Once the onions were out of the pan, I added about 2 tbsp of olive oil to the pan, heated it up on medium-high, and then put in my cup of raw rice. I stirred it so that all the kernels were covered with oil. All the recipes I've seen tell you cook the rice in the oil until the kernels turn translucent, but I noticed that mine were translucent right after I coated them in oil (probably due to using regular short grain rice). So I pushed the kernels around until some of them started to turn an opaque white color, which I assume is the point where the rice is starting to toast. Now, it was time to add the chicken broth. I ended up diluting 2 cup's equivalent of condensed chicken broth into 4 cups of water. I added 1/4 cup of broth to the rice in the pan, and stirred it in as it sizzled and sputtered. The rice absorbed the water very quickly, so I added another 1/4 cup of broth and stirred it some more. You simply repeat this step, each time stirring the rice until the broth has been mostly absorbed but not completely dried, before you add more broth. After 10 minutes, I added the cooked onions back into the rice, sprinkled on some salt and garlic powder to my discretion, and continued to cook it with broth, tasting a few kernels as I went along to check for doneness. You can make the risotto as soft or as chewy or crunchy as you'd like, but I prefer mine to be al-dente, soft on the outside with a bit of chew on the inside. When you've just about reached this stage (it took me about 20 minutes), stir in a final little bit of broth, then add your grated cheese and a pat of butter, stirring it all together so the cheese and butter melt. Let the broth cook down until the risotto is nice and creamy but not watery or dry, and serve immediately. After plating my risotto with my baked crab cake and some Shanghai bok choy (I needed some greens and it was all I had in the fridge – sorry it doesn't match the dish well), I tasted some of my browned/burnt onion bits from earlier and discovered that it was actually like caramelized onions, with a nice bit of sweet smokiness to it. So I sprinkled those onion bits on top of the risotto for a garnish, and my boyfriend actually thought it was really really good that way. So how did it turn out? Well, having not had other risottos to really compare to, I thought this simple and basic risotto tasted wonderful! It was creamy and soft with a bit of chew, and the chicken flavor really came through. I'm glad I used Trader Joe's broth, it's a good quality chicken broth with a lot of flavor minus the sodium. I also liked the creaminess that the Romano cheese and a little bit of butter provided, and the second batch of onions that I put into the rice came out nice and soft, melting into the risotto. Honestly, I was very very pleased with how it turned out, and I just couldn't get enough of it! (Don't save any for leftovers – it just dries up) I'm excited to try it again in the near future with other fun ingredients too. Risotto is really jazzed up rice, and I don't think I'll ever be satisfied with just plain rice ever again haha. 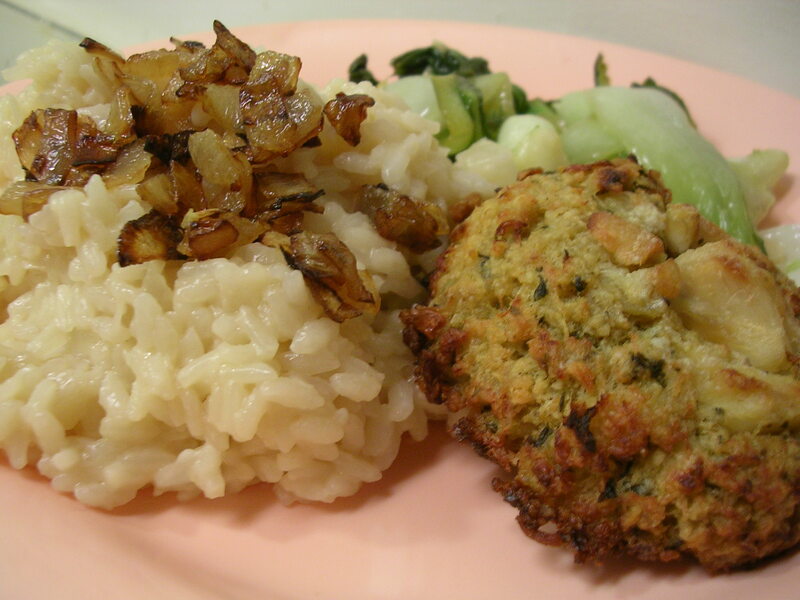 The risotto went really well with the crab cakes too, which were very savory and a bit on the salty side, thus complementing the mild nature of the risotto. Yum, as I'm typing this I'm craving more! This entry was posted on Friday, February 29th, 2008 at 5:50 am	and posted in cooking, Italian, recipes, seafood, Uncategorized. You can follow any responses to this entry through the RSS 2.0 feed.